HomeTechnologyTech Fix: Uber vs. Lyft: Which Ride-Hailing App Is Better? Uber and Lyft recently made clear that they are in the ride-hailing business for the long haul. Shortly after Lyft went public with plenty of fanfare last month, Uber shared its plans for its own initial public offering. So now feels like the right time to ask: Is one of the apps definitively superior for hitching rides? While both services look identical, there are major differences. Uber is richer in features and available in more cities. Yet Lyft is more transparent in its receipts about the details of a trip, which can help consumers understand when prices increase; Uber’s opaque receipts could leave people perplexed. I have used Uber and Lyft to hitch hundreds of rides over the last seven years. To take a closer look, I made them my only mode of transportation for the last week, using the apps to get around town while comparing their features, rewards programs, pricing structures, reputations and availability. In the end, I concluded that Uber had an edge, though the best app for you will depend largely on where you live and how often you need rides. Here’s a rundown of how the apps compare. Uber and Lyft are, for the most part, neck and neck in terms of their core features. To summon a car, you tap the app on your smartphone and enter a destination and pickup location. Then you choose the type of car you want: economy, luxury or larger vehicles with more seats like S.U.V.s. To streamline requests, both apps let you save frequently used locations, like your home or office. They both also let you add multiple drop-off points if you are sharing a car with a couple of friends. And to lower costs, both apps let you hail a car to share with a stranger who is going somewhere along your route: Uber calls its feature UberPool, and Lyft calls it a Shared ride. When a trip is complete, payment happens through the app, and you get an emailed receipt documenting the route. Uber includes a button to let you split the cost of the fare with multiple riders, which is handy when you’re out with a group. Lyft discontinued its fare-splitting feature last year and said it planned to release an improved version this year. Most important, Uber lets people request wheelchair-accessible cars in about 15 of its top cities. In my tests in San Francisco, wheelchair-accessible cars were available in many areas. Lyft, which declined to comment for this column, has a very limited wheelchair-accessibility program; I wasn’t able to summon one here. The verdict: In terms of ride-summoning features, Uber wins hands down. Its broader wheelchair-accessibility feature is similar to the option offered by traditional taxicabs. And Lyft’s lack of fare splitting makes Uber the app of choice for group outings. Fundamentally, Uber and Lyft charge roughly the same rates: Riders pay a fare based on the duration and distance of a ride. It’s when the companies raise prices that things get more confusing. 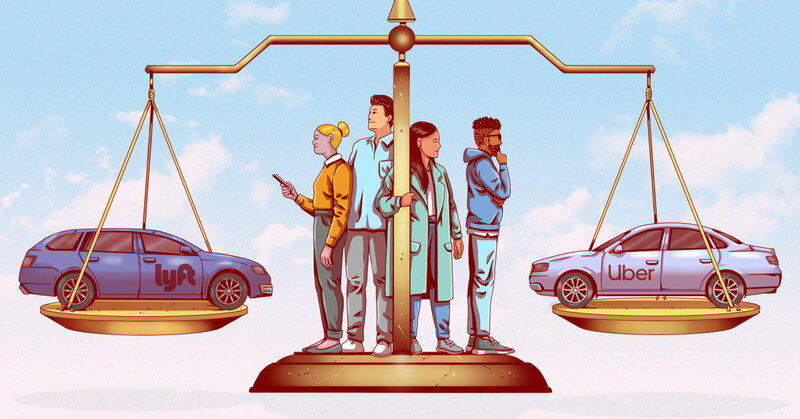 When not enough cars are available in an area with high demand, both companies use a system known as dynamic pricing, which scales up costs in accordance with supply and demand. So if you’re outside a popular museum and dozens of others are trying to summon cars, Uber and Lyft will raise prices to nudge additional drivers to come to the area. Uber calls its practice surge pricing, and Lyft’s version is labeled Prime Time. When Uber is “surging,” the app shows a multiplier — for example, 3X, which means the fare costs triple what it would normally be. Lyft marks up its Prime Time pricing with a percentage: If the rate is 50 percent, a fare that would normally be $10 costs $15. The verdict: Lyft wins, in part for greater transparency. Its receipts break out details like the duration of the trip and the distance traveled, which helps riders better understand overall costs. In its receipts, Uber does not show the length and duration of the trip; it shows a fare price. The vagueness can make things more confusing, especially when prices are higher because of unexpected circumstances like heavy traffic. In addition, because Uber is generally more popular in most cities, in my experience its surge markup is often significantly higher than Lyft’s, meaning riders are typically better off summoning a Lyft when cars are in high demand. Uber declined to comment, citing a quiet period before its I.P.O. Like airlines that reward loyal customers, Uber and Lyft offer some goodies to frequent riders. Uber provides a tiered rewards system. For most rides, you earn two points for every dollar spent, and the points help you climb toward higher statuses with different perks. At 2,500 points, for example, you reach platinum status, which gives you priority access to drivers at airports, among other things. Uber also offers Uber Cash, a program that gives discounts to those who buy credits that can be applied toward rides. So if you buy $100 of credits, Uber will give you $105 in Uber Cash, effectively a 5 percent discount. Lyft’s rewards program is limited. Last year, it started a program for people who set up business profiles, a tool that made it easier for riders to expense Lyft rides to their companies. For every five business rides that people took, they got $5 in personal ride credit. Late last year, Lyft said it would expand its rewards program so that all rides accrued points that could earn perks, like savings on future rides or upgrades to fancier cars. But so far the feature is available in only a few cities, and Lyft customers can join the program only once they receive an invitation via email or the app. The verdict: Frequent riders will benefit more from Uber’s rewards program, which is more comprehensive and compelling. If you are the conscientious type of consumer, take a look at the companies’ histories. In 2017, Uber was mired in scandal after scandal. Among them: A former employee detailed a rampant culture of sexual harassment; the company was revealed to have used a secret program to identify law enforcement officials and evade sting operations; and it disclosed that hackers had stolen data from 57 million driver and user accounts and kept the breach secret for more than a year. Uber’s former chief executive, Travis Kalanick, was forced to resign. Lyft has a cleaner track record. Last year, The Information reported that some Lyft employees had improperly gained access to user data, including rides taken by their romantic partners and high-profile executives like Facebook’s Mark Zuckerberg. The company investigated the allegations and added restrictions to employee access to data. The verdict: Though neither company is innocent, Lyft wins by a long shot. Uber has an advantage because of its broad availability worldwide. The company, which has operations in 63 countries, is a behemoth compared with Lyft, which is available in just the United States and Canada. The bottom line: In terms of features, reward programs and availability, Uber has an edge over Lyft. Even if you prefer Lyft in your hometown for ethical reasons, it may be practical to keep the Uber app on your phone in case you travel somewhere like London, Paris or Tokyo. Or you could try to hail an old-school taxicab wherever you travel, assuming you can find one.